Phew. It's the end of our Grand Launch Week for the Yasuní campaign, and I think we've really got somewhere. Anita Rivas, the mayor of Orellana in the Yasuní region, arrived in the UK last weekend. In the space of just five days, and with a little help from her friends, she has managed to put Yasuní on the agendas of British MPs, government officials and even a minister (pictured below). Her message was simple but powerful. 'The biggest issue today is climate change. By helping Yasuní, you will be helping the world.' Her aim was to persuade the British Government to support Ecuador's proposal to leave the oil in the ground and preserve the extraordinary Yasuní rainforest. But most importantly, she was here to ensure that the rights and needs of local and indigenous people are taken into account in the process. The week has been a whirl of lobbying, meetings and interviews. We're all exhausted - though Anita doesn't have time to be, she's gone to Luxumbourg for the day to address local governments before heading down to Spain for another week's of campaigning. But I think it's been a storming success. It began on Monday with a meeting with officials from three different government departments working on forests and climate change. They did not know about the proposal (despite it having been presented to the UN and the EU). So our crack campaign team, comprising Anita, Georgie and Ginés from the Yasuni Green Gold campaign, and Richard and I from NI, spent the rest of the week trying to put it on the Government's agenda. - A launch event, attended by 200 people including experts on Ecuador, forests, climate change and indigenous people. Speakers included Anita, the deputy Ambassador of Ecuador, and environmentalist Tony Juniper. - Agreement from the Ecuadorian Embassy that they will formally approach the British Government with the proposal in the next few weeks. - A promise from Steve Webb, Lib Dem spokesperson on energy and climate change, to meet with the Ecuadorian Ambassador about improving the proposal by allowing local people to participate in developing it. 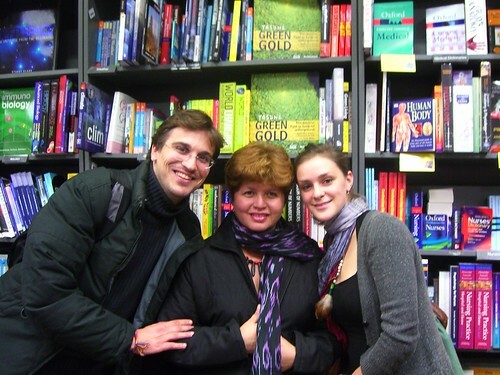 - Going into Waterstones with Georgie, Gines and Anita, to find copies of the Yasuní Green Gold book on the shelves! (See photo below). - A session in the House of Commons, chaired by Colin Challen MP who is chair of the All-Party Parliamentary Group (APPG) on Climate Change. It was attended by MPs, Lords and a Baroness. The campaign received enthusiastic support and offers of help from two other APPGs. - Colin Challen also tabled an Early Day Motion - which is like a petition for MPs to sign - in full support of the Yasuní Green Gold campaign. If you live in Britain, get in touch with your MP and ask them to sign EDM 2192! It all culminated yesterday in a really positive meeting with new Minister for Energy and Climate Change, Joan Ruddock. She told us that 'the Government is in favour of such initiatives - our sympathies and goodwill are there.' It was clear that the door is open. As soon as the Ecuadorian embassy contacts her, she will begin to consider whether Britain can help make the plan happen. I'm worried though. It's easy to agree that the oil should stay in the ground in principle. The controversy begins with discussions about where the money is going to come from. There's a real risk that Yasuní will be seized upon by carbon trading firms intent on turning it into a giant carbon offset, and the once visionary scheme will lose its integrity, its potential for involving and benefiting local people, and any contribution it might make to overall global carbon emissions reductions. Carbon trading lobbyists from three different banks turned up to the Yasuní Parliamentary event to express their enthusiasm for getting involved, and wanting to know who to lobby. Next week a report commissioned by the British Government will come out strongly in favour of financing forest preservation through the international carbon markets. So, not content with allowing bankers to screw up our economy, we're now going to put them in charge of solving climate change???? Whatever planet these people are on, it's not going to last much longer at this rate. Amy Booth reports from the back of beyond in Bolivia. It’s against the Constitution, and means Norway will not respect the Paris Agreement, argues Tina Andersen Vågenes. Alicia Cawiya, an indigenous activist prepared to defy the powerful to save Ecuador’s Yasuní, talks to Linda Etchart. Facts and figures about trees and forests, from carbon control to biodiversity. Aviation is a continued pattern of privilege for the very few at the expense of the many, argues Plane Stupid. Chris Garrard highlights problems with Shell’s sponsorship of the British Science Museum. Laura Stacey shares her experience from and motivation for participating in the camp. Kat Lyons looks back at the recent Day of Action to raise awareness of the climate crisis. Is the earth completely f**ked? Not if we fire money and hire survival, argues New York performance activist Reverend Billy. Student activists around Britain are lobbying for divestment from coal, oil and gas, report People & Planet. Jamie Kelsey-Fry catches a rare balanced debate on shale gas that marks the undoing of one of its greatest US evangelists. What lies behind Europe’s murky oil deals with Azerbaijan? Take a day off for St George! Sponsorship rejected, a lawsuit to stop Arctic drilling – Kevin Smith considers the impact on Big Oil. A journalist, an expedition and the Arrow People add up to a life-changing read for David Hill. There’s no escape for BP directors as Danny Chivers and others pull off an audacious direct action at the oil company's AGM. 22 April is Earth Day. Should punishment be made to those personally responsible for destroying our planet? Add your name to those urging the UK government to support Ecuador's initiative to keep the oil in the ground. But it won’t be long before they come up with another excuse, says Mike G from the Rainforest Action Network. Resource curse: Can Yasuni ITT Initiative learn a lesson from Ashio copper mines experience?